Who needs legs? 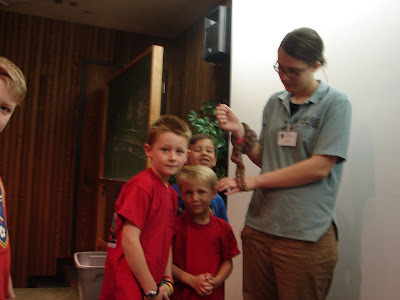 Apparently not snakes...This past week's Saturday Safari was tons of fun! We had the opportunity to learn a lot about snakes and the traits and qualities that make them great. Lauren taught us how closely related snakes and lizards are. She even fooled us with pictures of lizards that look just like snakes. We had the play with real live snakes. 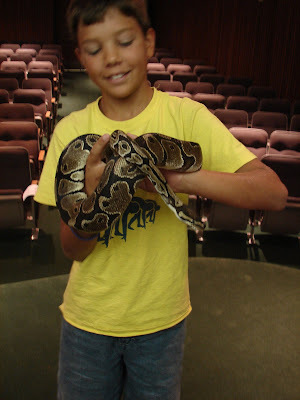 The consensus between the children involved was that Cuddles (the Ball Python) was the coolest. Being the biggest snake not only helps to ensure your survival, it also makes you cool in the eyes of children...at least this was the case with Cuddles. All in all, we owe Lauren a debt of gratitude for helping us to appreciate snakes. Overall, she taught us that snakes are our friends and not our enemies! In the month of July the Bean Museum had its first ever Reptile and Amphibian Nature Experienceship. A field trip was planned to catch reptiles in Diamond Fork Canyon. Each person got a packet of information about reptiles we wouldn’t be seeing that day, a short guide to the reptiles and amphibians found in that area, and the use of the Museum’s reptile catching equipment. Earlier in the week of our experienceship the sun had been shinning everyday, but that morning the sky was cloudy and cold. Even though the weather wasn’t ideal for reptile hunting we still ended up catching three fence lizards and saw two others. We also got to come back to the museum for a short tour of the Herpetology collection and to see some of the museum’s live reptiles. It was a lot of fun.